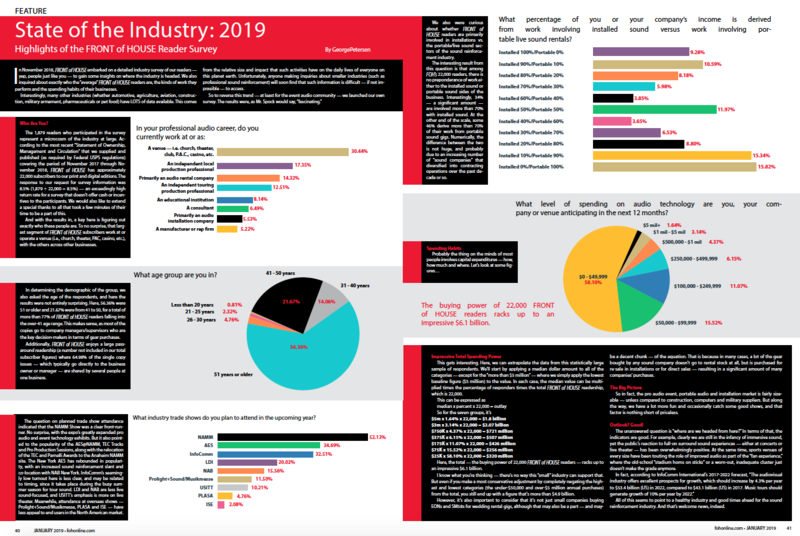 In November 2018, FRONT of HOUSE embarked on a detailed industry survey of our readers — yep, people just like you — to gain some insights on where the industry is headed. We also inquired about exactly who the “average” FRONT of HOUSE readers are, the kinds of work they perform and the spending habits of their businesses. Interestingly, many other industries (whether automotive, agriculture, aviation, construction, military armament, pharmaceuticals or pet food) have LOTS of data available. This comes from the relative size and impact that such activities have on the daily lives of everyone on this planet earth. Unfortunately, anyone making inquiries about smaller industries (such as professional sound reinforcement) will soon find that such information is difficult — if not impossible — to access.